Cartier are one of the worlds most respected and admired brands, their jewellery and time pieces are revered across the globe. 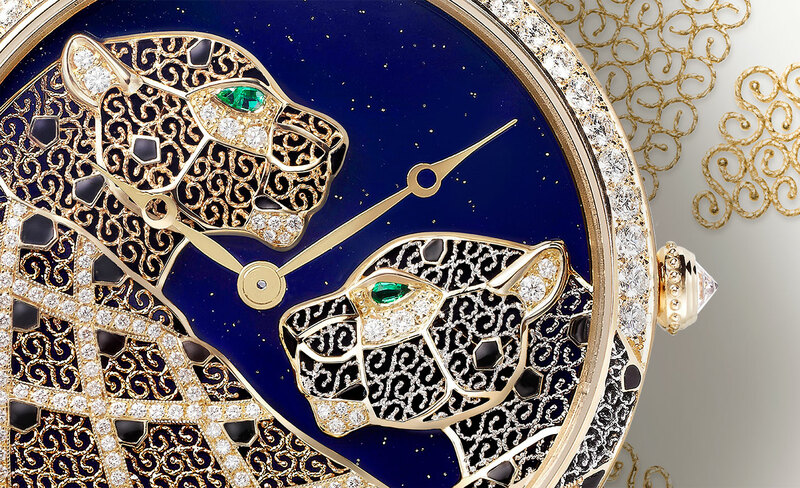 Amongst their vast creations, it is difficult to pin point just one item which stands out from the crowd, but their Cartier D’art watch collection has proven to rise above its brethren and showcase some truly amazing horological designs. Each piece is painstakingly crafted to perfection, offering some of the most stunning man made constructions to adorn your wrist. 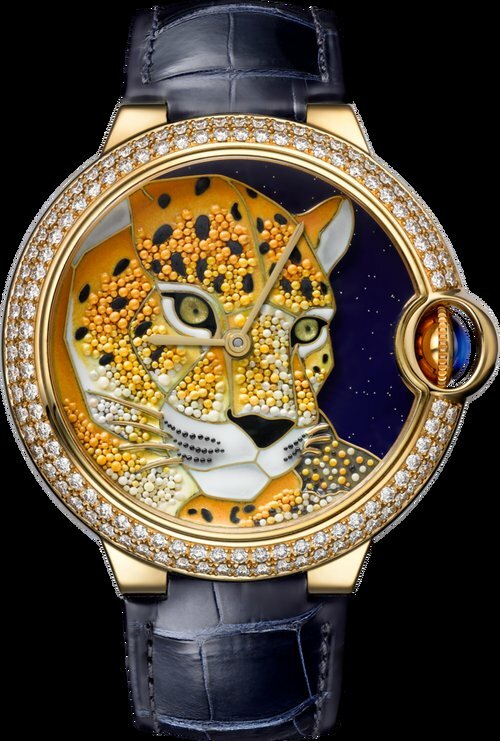 Each individual piece has a rare and exotic creature from our beloved animal kingdom emblazoned upon its face, signifying the rarity of the watch. The faces of these watches are created by expert artisans in a 300 year old converted barn, ensuring they get the utmost privacy whilst practicing their craft. Each time piece has a very unique construction of its face, entwining traditional design techniques with modern technology to create something truly special. Each watch is only available in very limited numbers and due to the handmade skills needed to fabricate these mini masterpieces, you can be sure why. Some taking up to 2 weeks to finish just a portion of the final design. The Cartier D’art collection has 9 very unique styles available, below Fashion Runway has showcased each for your perusal. Sporting a fantastic panther upon its face, crafted out of black enamel and 18 carat gold. The grisaille gold-paste technique is used to create the big cat, constructed using a combination of very fine brushes and needles. No fewer than 67 brilliant cut diamonds are placed along the edge of the watch case, with a further 43 smaller diamonds on the buckle of the alligator strap. Extremely limited to just 80 pieces. 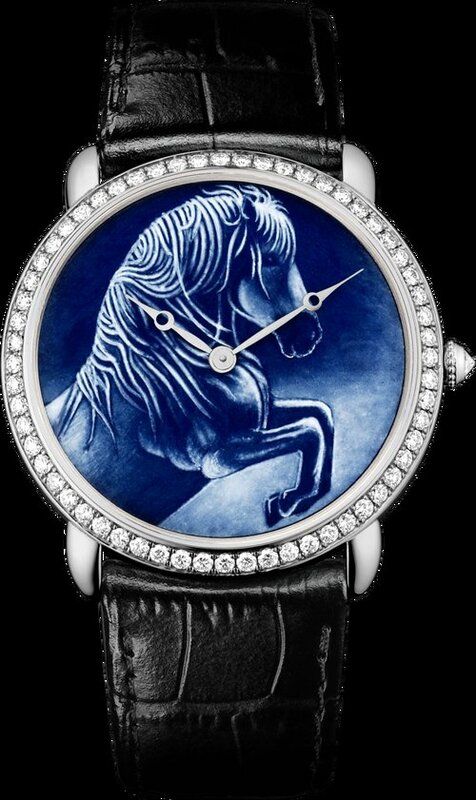 Featuring an 18K White Gold dial with grisaille horse decor, hand painted in striking blue and white. Outer edge of the case contains 61 diamonds and a further diamond taking the place of the watch crown. The hands are particularly beautiful in rhodiumized steel. Numbered and limited edition with just 80 created. One of the older designs in the collection, first introduced in 2013, but still commanding attention as one of the most spectacular. 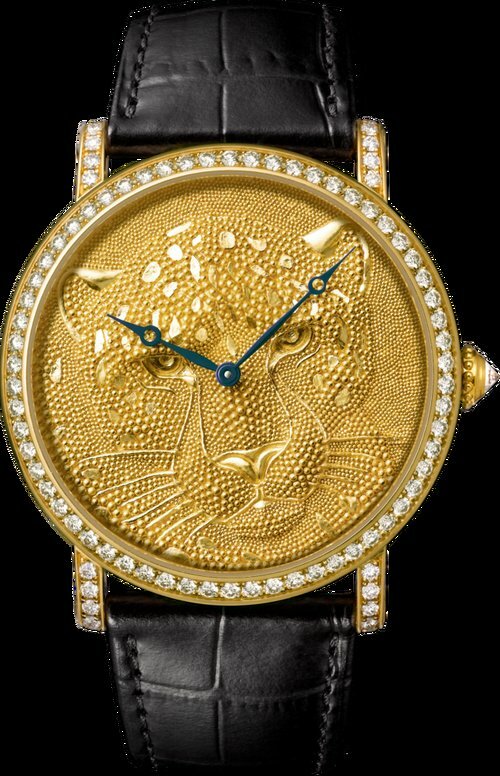 The gold panther face is created using the granulation technique, a very lengthy task. Cartier themselves call it “Sowing seeds of gold” 3,800 gold beads are used to create the 22K carat face. Each is a tiny cut piece of wire, rolled in a charcoal dust, flame heated and then finally fused with gold plate to give that unmistakable colour. It takes an estimated 320 hours to piece together the beads upon the watch face, and a grand total of 3,500 firings altogether. Due to its arduous creation time, this piece is limited to a very few 20 pieces. 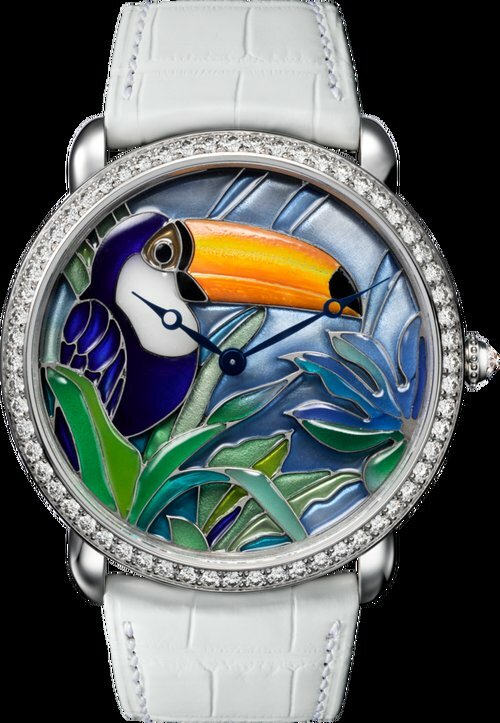 One of the more elaborate and colourful of the Cartier D’art collection, the Toucan designed piece from 2014 is created using the plique-à-jour enamel technique. The Toucan shape is traced and crafted using a tiny soldered gold thread. The vibrant colours are produced using a very specific method, taking enamel in its raw origin form, melted down at very high temperatures and then ground down into a powder named flux. Metallic oxides are added to the mix to create the wide variety of colourful tones. They can then be added to the toucan framework. Each of the individual 21 colours has to be fired at unique temperatures exceeding well over 800 degrees. Extremely limited to only 40 pieces. 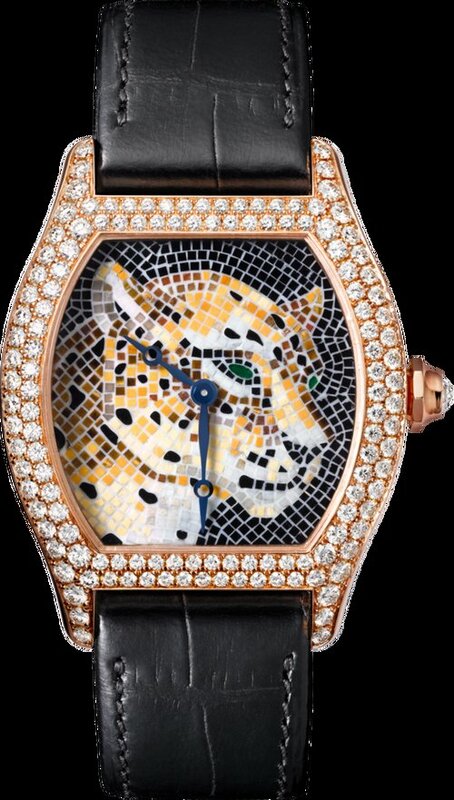 A particularly beautiful designed timepiece, its face styled in the shape of a panther in a mosaic pattern akin to ancient Greek artwork. Using a combination of precious stones and onyx stones, along with a 18K pink gold dial and a breathtaking 123 brilliant cut diamonds surrounding the casing. Each of the limited 30 pieces is individually numbered. A striking white alligator leather strap is used to hold this beautiful time piece to your wrist. 22K gold granulation laid across the 18K gold face, on top of which sits a mother of pearl design with orchid engraved decor, featuring yellow gold flower pistils coating in vibrant red enamel. 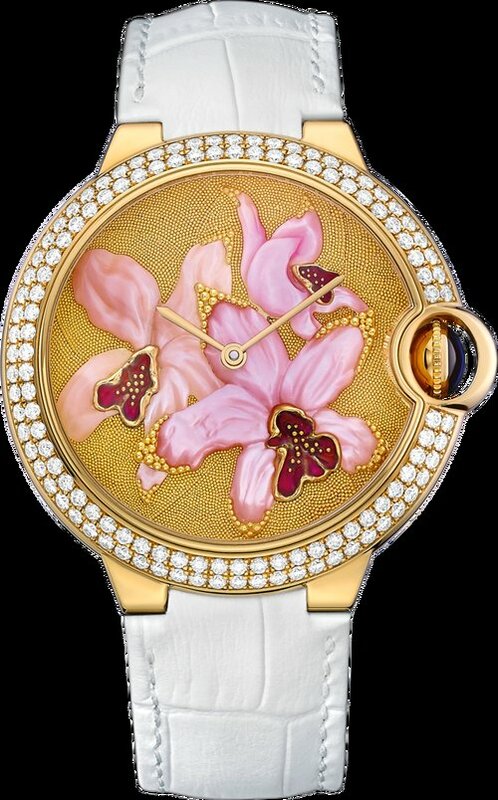 Each of these flower inspired watches holds 124 diamonds upon its casing and 43 along the buckle. Only 40 of these amazing watches are available. My personal favourite of this collection, mostly in part due to how the face is crafted. With one of the most beautiful creatures of the animal kingdom as a basis for its design, the parrot. Floral marquetry is the ancient craft used, rose petals are gathered, coloured and then cut into the desired shapes, each tiny piece is then applied using very steady hands to the gold dial. 2 weeks pass before the marquetry is finalised and a grand total of 3 weeks to create the whole dial. Black enamel is used for the parrots beak and an additional emerald for its eye. Its case is 18 carat rhodium white gold and a total of 118 brilliant cut diamonds. Very few of these are available, only 20 produced. With their continuing obsession of using panthers, they have upped the ante by using 2 of the jungles big cats on this watch. Filigree craftsmanship is the special technique used in this instance. The blending of 950 platinum wire and 22k gold wire together which is shaped, styled and hammered in the shape of the two panthers and finally soldered together. This alone takes a minimum of 10 days. An application of lacquer and emeralds finish the beautiful face work. 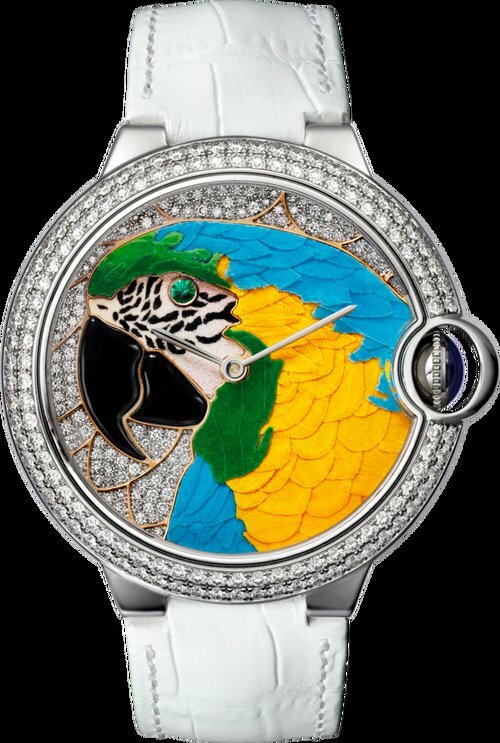 Setting off the design is a blue alligator strap containing 43 diamonds on the buckle, along with the 58 diamonds adorning the face. Very limited numbers, with just 20 due to be crafted. 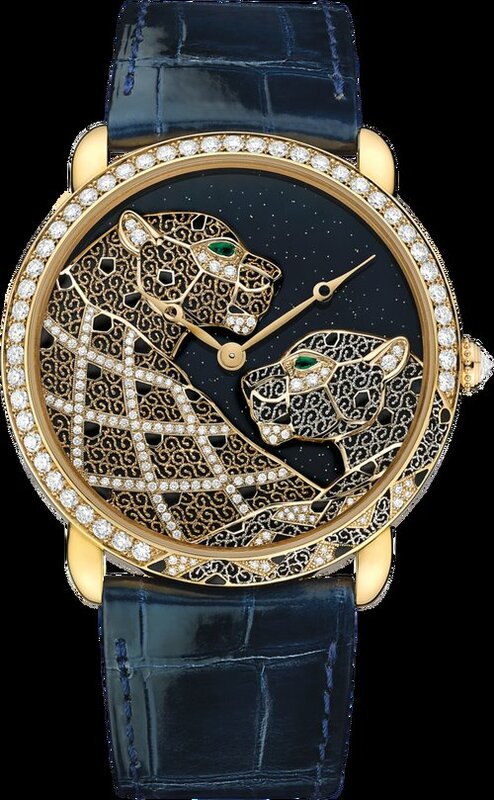 Finally we have the last watch in the collection, a stunning finale to the line up of Cartier D’art time pieces. 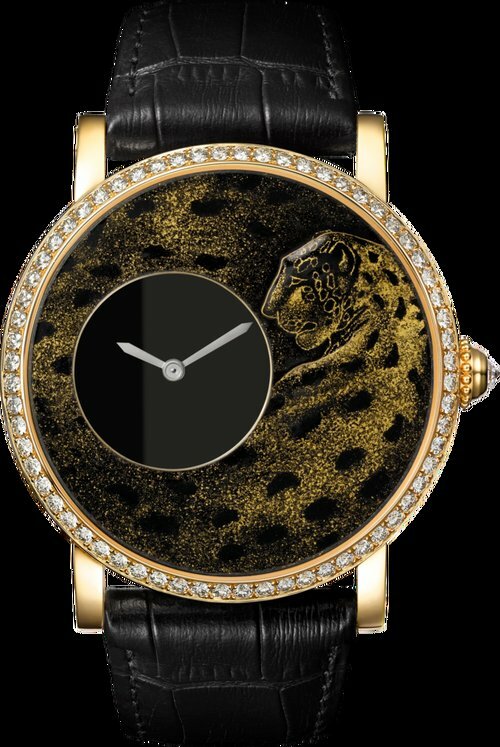 This stunning watch boasts a 22k gold dial, the face of which has been hand crafted using enamel and etruscan granulation mixed with spangled blue lacquer to create the panther design. The crown on this watch has the unique addition with its cabochon sapphire in a fluted shape. A shiny blue alligator strap finishes the beautiful design, again featuring the signature 43 diamonds on the buckle, alongside the 124 around the casing, totalling 1.80 Carats.